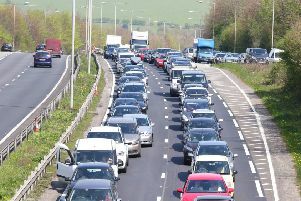 Emergency services are at the scene of an accident that is blocking the A27 in Arundel. According to traffic reports, Lyminster Road is blocked in both directions due to the accident between the Ford Road roundabout and the Causeway roundabout. Traffic is taking turns to pass the scene of the collision, according to reports. The accident is causing congestion back to Havenwood Park for eastbound traffic, with westbound traffic backed up to the Crossbush Junction.